Recently in London we’ve seen two seemingly very different responses to traditional Korean and Chinese landscape painting. In March we had Lim Taek (임택) at I-MYU; just finished at Union we had Lee Sea-hyun (이세현). Both artists portray the familiar mountains, the occasional ancient pavilion dotting the landscape. 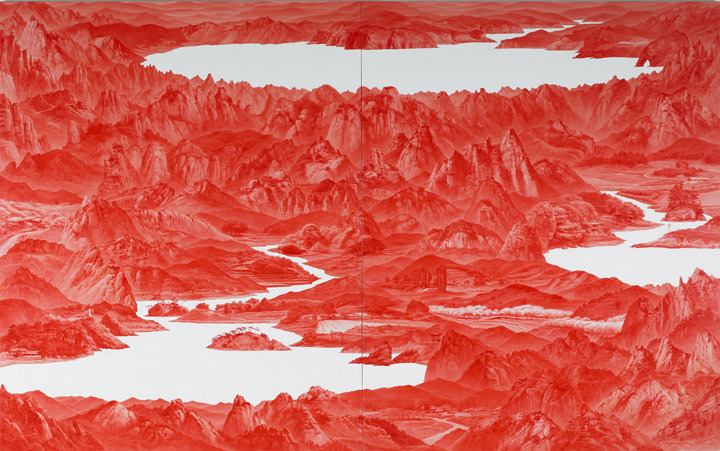 But Lim’s mountains are simple blocks of white against a rich blue sky, and while Lee respects the conventions and has a blank background against which his carefully delineated peaks are set, he defies conventions in another way by presenting his landscapes in a ghostly red. Considering the two responses side by side allows some interesting similarities and contrasts to be highlighted. Stand in front of Lim Taek’s surreal landscapes and what appears on the surface is some entertaining Photoshop trickery. 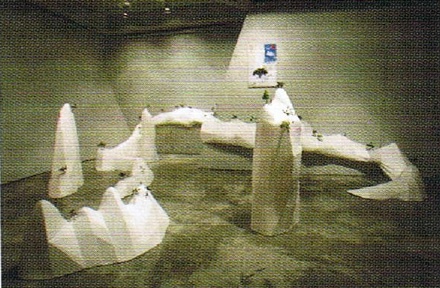 Lim’s creative technique is to first create a three-dimensional model of a range of mountains, in a highly simplified style. The mountains are then decorated with models of temples and other items. At an exhibition, spectators can wander through these model landscapes (right) – a recent installation was in Insa Art Centre (2006). 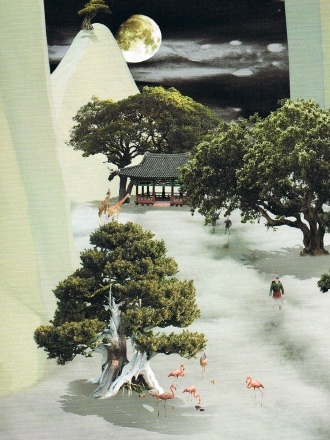 Playing with two and three dimensions, Lim dots his landscapes with real bonsai trees and cut-out photos of trees. Having introduced one jarring element into his work, Lim has only just started. 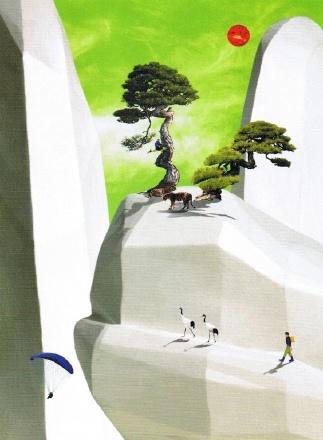 He plays with introducing elements from different geographies (giraffes and flamingos rather than tigers and cranes grace his landscapes – left); chronologies (an SUV is seen climbing the mountain) or cultures (a Japanese lady is seen enjoying the sun). Into this melee Lim brings the actual spectator. As spectators wander through the installation, they are photographed and the resulting miniature cut-outs are then introduced into the landscape. The fun really begins when Lim photographs the three dimensional landscape installation and starts playing with his software. Lim, like most Korean art students, is well-drilled in traditional Korean and Chinese landscape painting. The genre depicts mountains, waterfalls, auspicious items of flora and fauna, and maybe a scholar contemplating his latest compositions outside a pavilion. Once the conventions are understood, it’s easier to start playing with them. Perhaps Lim’s most obvious joke is to overturn the convention regarding the purity of white space. 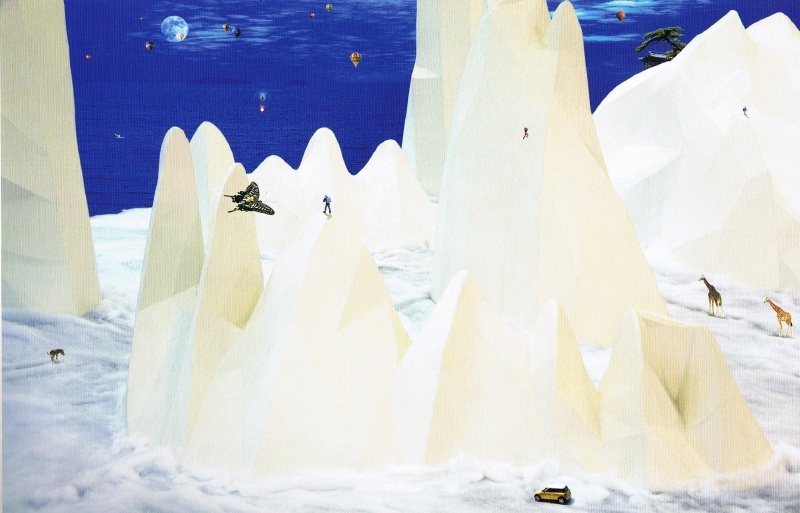 Instead of leaving the “canvas” white to depict the sky, and instead of lavishing attention to detail on the landscape itself, Lim reverses the convention – colourful skies (deep blue or a crazy swirling green – right) and plain white mountains. Photoshop enables all sorts of games to be played: valley floors seem to be shrouded in mist, while the rest of the landscape is clear. Colours, of course, are far from natural. And where some of the juxtapositions cannot be achieved in the physical world, they are possible in the digital world: Lim is able to play with the interplay of the possible (if unlikely) and impossible (in the latter category falls the depiction Lim himself riding a seagull or a giant butterfly – just visible above). Lim calls his series of work “transferred landscape” – a riotous parody of the classical landscape genre. Unusual physical juxtapositions and a playfulness with two and three dimensions link Lim Taek’s playful parody landscapes with Lee Sea Hyun’s more sombre creations. While Lim’s landscapes are clearly a jumble of contrasts and contradictions, stand in front of Lee’s landscapes and you see, initially, harmonious and homogeneous compositions. The unusual feature of Lee’s work is the colour – apparently inspired by Lee’s experiences wearing infra-red night-vision goggles while on military service near the DMZ. We see the landscapes through this ghostly red filter, and the unreality is reinforced by the fact that the landscapes are empty of people. 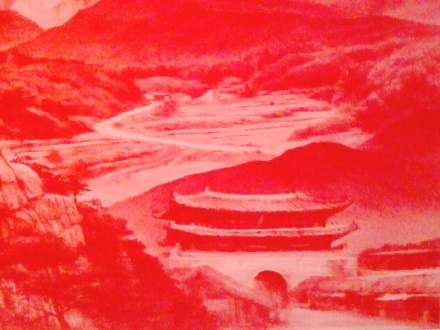 To this particular viewer, the colour recalls more the bleeding red laments and angry protests of minjung artist Lim Ok Sang, where the land itself seems to grieve for the wounds inflicted in war and by the Yushin policies of Park Chung-hee. Yet minjung politics is not something that Lee espouses in his statements. Instead, his business is more with the quiet beauty of the countryside of the DMZ. Included in Lee’s fantasy landscapes are, we are told, mountain ranges from both north and south of the DMZ; an educated eye can maybe make out northern and southern styles of rural domestic architecture. And probably an even better educated eye can detect differences in the landscapes due to different farming practices. (Indeed, one or two of the fields almost look as if they could be located in Northern France). Although they are intricately crafted Lee’s landscapes are no less impossible than Lim Taek’s. In piling peak upon peak, the composition recalls the type of mountainous picture a child might draw, or a type of Tolkeinesque world (above). One is drawn into the landscape, forced to trace the flow of a river from its origins in a mountain waterfall to the broader flow in the plains. But on close inspection there are things not right with the landscape. In the real world, one does not find carefully ploughed farmland in a valley in the heart of a vertical-sloped mountain range. Only in a fantasy landscape do you see a tiny band-stand-like pavilion perched on an outcrop just above some farm buildings. Nowhere will you find a grand Namdaemun-style gate (right) or a lighthouse perched atop an ugly mound of concrete tetrapods (left) located so close to a pastoral idyll. And if you look more closely at the full collection – titled “Between Red”, you will see the evidence of what looks like Photoshop – or at least a collage-based approach. 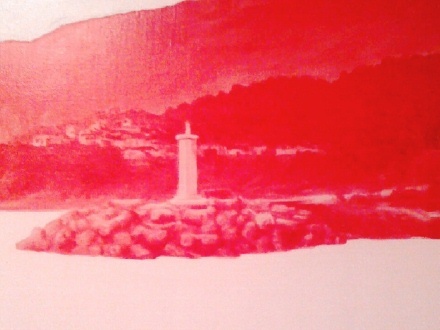 In different pictures you will see precisely the same line of trees, precisely the same farm buildings, the same mountain waterfall, the same breakwater or lighthouse, all in precisely the same dimensions and orientation, as if these elements are mix-and-match building blocks of Lee’s infra-red world. 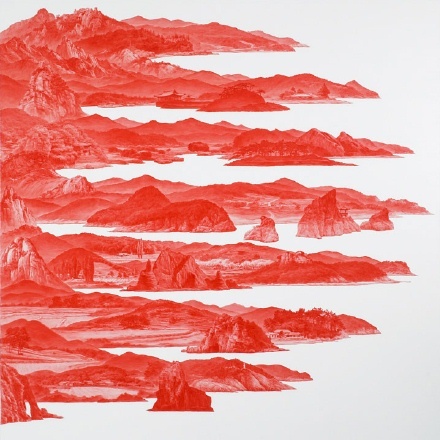 What Lee is trying to say by this repetition is unclear, but individually the compositions are pleasing to the eye and reward more in-depth study by asking the viewer questions about historical conflict and the environmental impact of economic progress. Indeed, despite the title, the series seems to be more about red’s complementary colour: green.